Around the year 1225, an illuminated Bible was made for the king of France. 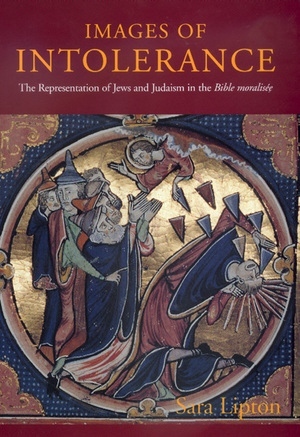 That work and a companion volume, the two earliest surviving manuscripts of the Bible moralisée, are remarkable in a number of ways: they are massive in scope; they combine text and image to an unprecedented extent; and their illustrations, almost unique among medieval images in depicting contemporary figures and situations, comprise a vehement visual polemic against the Jews. In Images of Intolerance, Sara Lipton offers a nuanced and insightful reading of these extraordinary sources. Lipton investigates representations of Jews' economic activities, the depiction of Jews' scriptures in relation to Christian learning, the alleged association of Jews with heretics and other malefactors in Christian society, and their position in Christian eschatology. Jews are portrayed as threatening the purity of the Body of Christ, the integrity of the text of scripture, the faith, mores, and study habits of students, and the spiritual health of Christendom itself. Most interesting, however, is that the menacing themes in the Bible moralisée are represented in text and images as aspects of Jewish "perfidy" that are rampant among Christians as well. This innovative interdisciplinary study brings new understanding to the nature and development of social intolerance, and to the role art can play in that development. Sara Lipton is Assistant Professor of History at State University of New York, Stony Brook.